Bruno Cornacchiola was a poor Italian tram conductor in Rome who was a Protestant Adventist and a Communist. In fact, his anti-Catholicism was so extreme that he plotted an assassiantion of the Pope. On April 12, 1947 while he practiced for a upcoming anti-Catholic lecture, he and his children encountered the Virgin in a grotto at Tre Fontane. Bruno went on to claim 28 additional apparitions. A definitive judgement, either positive or negative in regard to the authenticity of Tre Fontane, has not been made. Click here to view images from Tre Fontane. Bruno marries Iolanda Lo Gatto and moves to Spain to earn money fighting in the Spanish Civil War. Bruno works as a tram conductor in Rome to support his three children (Carlo, Gianfranco, and Isola). He embraces Communism, divorces his wife, and fights on the side of anti-Catholic forces during the Spanish Civil War in the 1930s. He later returned to his wife but was far from a model husband using foul language, committing adultery and forbidding her to practice her Catholic faith. He converts to 7th Day Adventism and became an ardent prostelytzer. He conceived of a plot to assassinate the Pope Pope Pius XII on September 8th, 1947 the Feast of the Nativity of the Blessed Virgin Mary. On the Saturday after Easter Sunday, Bruno took his three children to a picnic to Trefontane (the place of the decapitation of St. Paul and also called the Fountains of the Blessed Trinity). Bruno sat in a cove of eucalyptus trees earlier that day as he wrote his notes for a presentation ridiculing of the Immaculate Conception. He wrote on the base of a statue of the Virgin Mary "Virgin Mother - you are neither Virgin nor Mother". Bruno and his children encountered the Virgin Mary at a grotto in Tre Fontane when they are looking for a lost ball. He saw his child kneeling with a radiantly joyful face at the the entrance of a cave repeating the phrase "Beautiful lady!". Bruno couldn't see anything but his other two children began to kneel as well. Afraid, Bruno tried to grab his children and run but he could not move them. A bright light momentarily blinded him and he felt weightless and his sould was leaving his body. When his sight returned he saw a woman of celestial beauty wearing a dazzling white dress with a rose sash and a long green mantle. She said that she was the "One who is of the Divine Trinity" and identifed herself as "Daughter of the Father, Mother of the Son, and Spouse and Temple of the Holy Spirit. I am the the Virgin of Revelation". She admonished Bruno, "You persecute me. Enough of it now. Enter into God's kingdom on earth. The nine first Fridays of the Sacred Heart have saved you. You must be like flowers picked by your daughter Istola- they make no protest, they are silent and do not rebel". (Early in his marriage Bruno had previously in his life attended nine First Fridays prescribed by St. Margaret Mary Alacoque with his wife hoped he would be converted.) "In this place of sin, I will perform miracles for the conversion of unbelievers." (That place known immorality was later turned into a grotto where the dirt was considered miraculous) "Return to the pure source of the Gospel. Pray much and recite the rosary for conversion of sinners, of unbelievers, and of all Christians". Anticipating the proclamation of the 1950 proclamation of the Dogma of the Assumption, she explained "My body would not be allowed to decay. My son came for me with his angels." The vision lasted 80 minutes. She gave him a special message to be delivered to the Pope. The local Church authorities carry out an investigation. The Vicariate of Rome approves the cult of the Virign of Revelation. A special statue of the Virgin of Revelation was blessed by Pope Pius XII and then taken in procession from St Peter's Square to Tre Fontane. Bruno meets with Pope Pius XII in his private chapel, surrendering his dagger and confessing his assassination plot. The Franciscan Conventual Friars Minor were given custody of the Grotto of the Three Fountains. On the fortieth anniversary of the apparition, Cardinal Poletti, the Cardinal Vicar of Rome, and thus the Pope's official episcopal representative for the diocese, came to the shrine to celebrate Mass. Bruno Cornacchiola died Friday, the Feast of the Sacred Heart of Jesus, at 12 noon. IBruno reported that the "beautiful woman" which his children first saw had a motherly but sad expression. She wore a a green mantle over a white dress with a rose-colored sash around her waist. In her hands she held an ash-gray book close to her breast, while at her feet he could see a crucifix which had been smashed, on top of a black cloth. 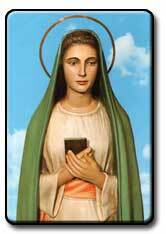 The Virgin appeared for approximately 80 minutes on April 27, 1947 and delivered a series of messages which included a reference . By 1986 Bruno had claimed 28 additional apparitions by the Virgin, with an increasingly apocalyptic tone. These additional claims, in addition to his questionable character, have prevented the apparition from gaining official approval. The most obvious miracle was the conversion of Bruno to Catholicism after he had been decidedly anti-Catholic and had plotted to kill the Pope. According to one account, in 1937, while still a cardinal, Pope Pius XII (then cardinal Pacelli) had a meeting with a holy woman who had apparently seen Mary in a vision at Tre Fontane. She related how the Virgin had told her that she would return to the grotto and convert a man who wanted to assassinate the Pope, and moreover, that he, Cardinal Pacelli, would himself be Pope. His reply was cautious, and in effect he said he would wait and see, but in 1939 Eugenio Pacelli duly became Pope Pius XII. Given all this, it is understandable that the cult of the apparitions at Tre Fontane was approved so rapidly. While the cult of The Virgin of Revelation was quickly approved, a definitive judgement, either positive or negative in regard to the authenticity of Tre Fontane, has not been made. AirMaria.com series "Marian Shrines of the World"
Tre Fontane is located fairly close to the Basilica of Saint Paul's Outside the Walls and even closer to the Church of Saint Paul at the Three Fountains. It is across from the location of St Paul’s Martyrdom at Tre Fontane, Rome. To reach the site you take line B on the metro and get off at Laurentina, come out of the metro station and walk to the main road, turn right and walk for about 10 minutes and the grotto is on that street. O Most Holy Virgin of the Revelation, You who are in the Divine Trinity, we ask you to turn your merciful and kind eyes towards us. O Mary you are our powerful advocate before God, and with the soil of the Grotto You obtain graces and miracles for the conversion of unbelievers and sinners. Obtain from your beloved Son, Jesus Christ, we beg you, the salvation of our soul, the health of our body and the graces that we so need. Obtain for our Holy Church and her visible head the Supreme Pontiff the joy of seeing the conversion of her enemies, the spreading of the reign of Christ over all the earth, the true unity of all believers in Christ and the peace of all nations so that we can love and serve You in this life and thank You in Heaven for ever and ever. Amen.